A wonderful story of a widow and her adorable son. Janet Leigh is Connie Ennis, a woman recently widowed in the war. To support her son Timmy she works as a comparison shopper. One day she buy a train from Steve Mason (Robert Mitchum) and tries to return it the next day. Steve informs her that he knows what she is doing and he needs to turn her in to his superiors. Then she tells him that she is a widow supporting her son he gives her a refund and is fired in the process. They meet up in Central Park a few days later and they go on a shopping spree together. When Steve comes to her apartment he meets Timmy and someone else - her beau Carl Davis. When an expensive gift for Timmy arrives on Christmas morning Connie goes to find Steve and return his money. He spends Christmas dinner with the family and tells Connie that she should marry him and not Carl. Now will Connie choose stability with Carl or love with Steve? This movie was very good. Mitchum and Leigh were wonderful as Steve and Connie. Gordon Gebert stole the movie as little Timmy Ennis. 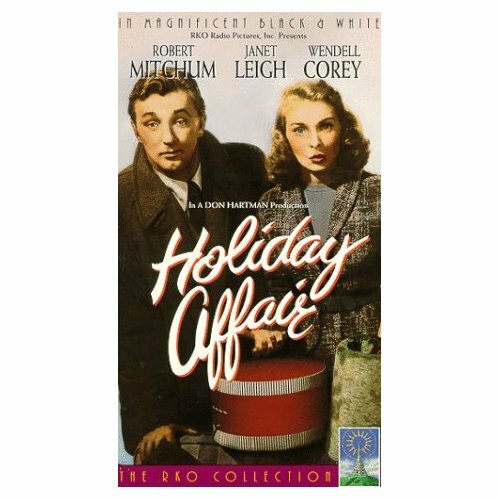 This movie is not as well known as some of the other Christmas classics but it is a fun and interesting romance. There was a made for TV remake filmed in 1996 starring Cynthia Gibb and David James Elliott. This movie is a great one for all of us who love these old romances.